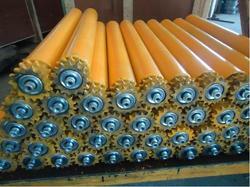 Rollers For Chain Driven Conveyors. We design, manufacture and assemble our rollers so that we can offer the right roller for the right price for your factory. We manufacture our own sprockets so we can also offer specials made to suit your existing profiles in; Simplex, Double simplex, Duplex and even Triplex profiles. Looking for Sprocket Rollers ?